I’m a believer in healthy treats. Guilt-free sweets. Using whole-grain flours and as little sweeteners as possible. But you already know that. I assure you that this is the healthiest pie you will eat this summer. It will leave you feeling light and clean, rather than heavy and full like most desserts do. 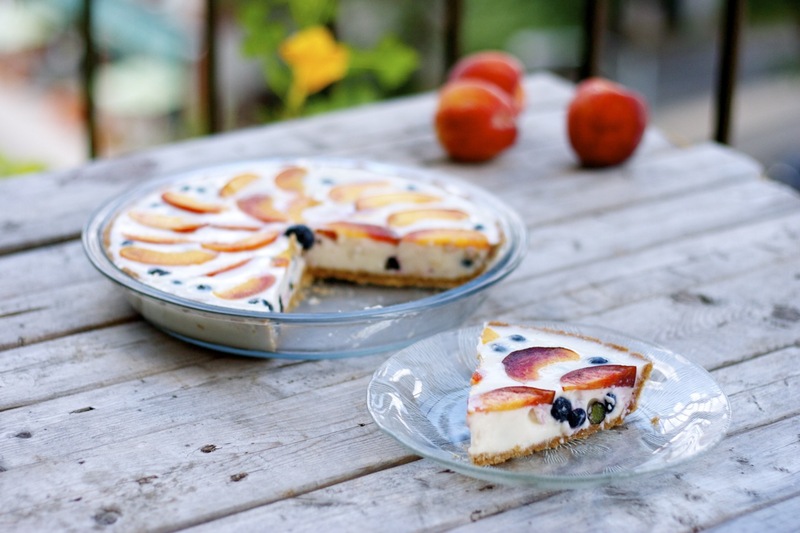 I used blueberries and peaches, but any combination of fruit in season would work. Blackberry-nectarine, raspberry-plum. Blueberry-kiwi! Wouldn’t that be fun? Use your imagination. For the pie crust: Preheat oven to 375 F. Directly in a 9-inch pie dish, combine the flour, salt and brown sugar. In a measuring cup, whisk the oil with the water. Slowly pour the liquid over the flour and mix it in a little with a fork. With clean hands, work the oil & water into the flour and press the dough into the pan as evenly as possible. With a fork, prick the bottom and sides of the dough. Bake in preheated oven for 12-15 minutes. Allow to cool for at least 30 minutes before adding the yogurt filling. For the pie filling: In a small saucepan, mix the gelatine, brown sugar and the milk. Heat over medium-low, stirring often, until the gelatine and sugar are dissolved. Remove from heat and let cool for 10 minutes. Meanwhile, in a medium-sized mixing bowl, combine the yogurt, vanilla extract and blueberries and set aside. Add the milk mixture, combine and cool in the refrigerator for 15 minutes. 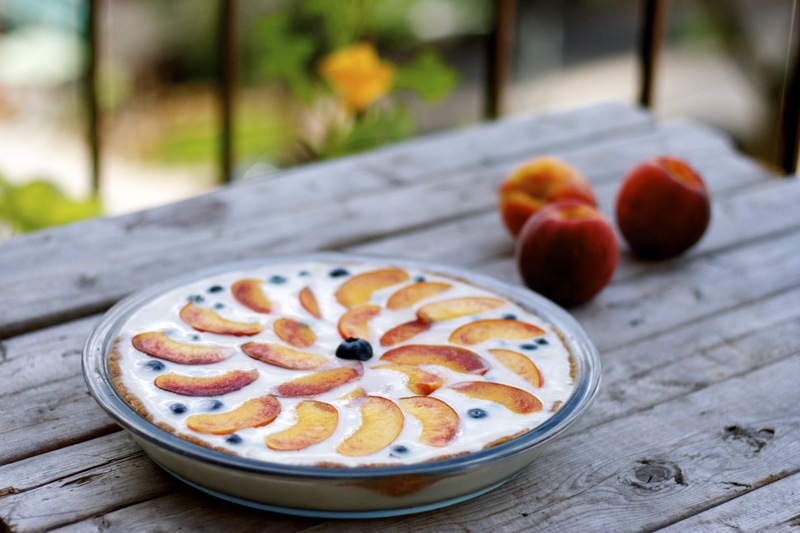 Pour the blueberry yogurt mixture over the crust and decorate the pie with slices of peaches. Refrigerate for 2 hours, or until the yogurt filling has set. Serve with a drizzle of maple syrup, if you wish. Best enjoyed within two days. Recipe inspired by my mother. Whole-wheat crust adapted from Vicki Chelf Hudon.